Pistol Pete Maravich Dribbling Drills video DVD from the acclaimed Homework Basketball DVD series is one of the most in-depth basketball instructional videos ever produced on the subject of basketball dribbling. These are the same skills and drills that young Pete Maravich practiced and then became one of basketball’s all time greats! It doesn’t matter if your dribbling skill is beginner or if you have had years of practice, study this DVD. Practice what it teaches, and soon your game will improve dramatically! 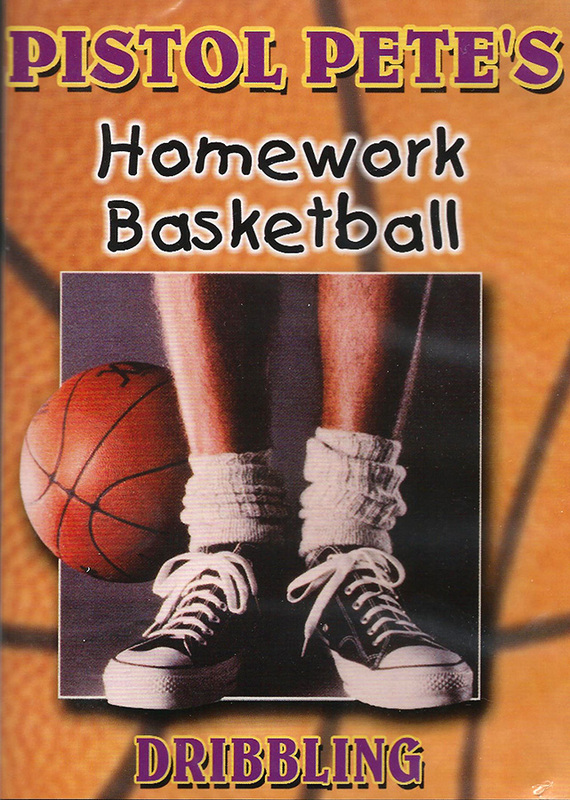 Pistol Pete’s Homework Basketball instructional series is designed for all ages. In Pistol Pete’s Dribbling Drills DVD video you will learn many drills like the “Square V Dribble”, “Walking” while dribbling, you will learn hand placement while dribbling, backspin while dribbling, wrist snap while dribbling, and much more. Pete will give you step by step instructions on these drills, he will periodically review what you have learned thus far, and at the end will summarize everything you have learned on the subject of Dribbling. Pistol Pete’s teaching on Dribbling is basically the same approach you would take to learn any other subject such as math or reading. You learn the techniques, you do your homework, you review what you have learned, you test on what you have learned, and then you combine what you have already learned with your next lesson. It’s just like taking a regular school class, but with the Homework Basketball series, Pistol Pete Maravich is your own personal teacher! Once you’ve learned walking in dribbling in Pistol Pete’s Homework Basketball Dribbling DVD, then you learn running while dribbling and much more. These are some of the specialized skills you will learn in the mechanics of dribbling under the teaching of Pete Maravich. From basketball dribbling fundamentals to advanced and creative dribbling techniques, Pistol Pete’s Dribbling Drills video DVD from the Homework Basketball series has it all. You’ll learn the “no-look” passes that Pete was famous for. You’ll learn the between the legs dribbling, the behind-the-back passing, the spin moves, the defensive techniques, and so much more in the Homework Basketball series.